This topic contains 280 replies, has 81 voices, and was last updated by Mike 7 hours, 40 minutes ago. My desk currently has 15mm Modern Aussies & North Koreans, and 28mm Pulp type figures: a number of bits and pieces I am painting up so I can play my first game of Pulp Alley. A Compagnia Meccanizzata of the St. Vincent Brigade and one of the Vinnies’ two BOLOs, a wing of Polish dropships, and (off camera to the right) I. Eskadra of the Krakow Winged Hussars. Cheers for your comments, that’s a tidy work desk Mr. average I wish I could keep mine that neat . Look, something not 6mm sci-fi in my painting space. I thought you were allergic to anything not 6mm sci fi Michael. On my painting table I have really been burning through unpainted lead. Have maybe 50 15mm figures waiting for attention; QRF Russians and dinosaurs, Khurasan North Koreans, Rebel Minis zombies, Blue Moon Victorian civilians. A recent transfer at work has seen me have a lot more free time, so getting a lot more painting done. Exciting times. Of course, I still have 200 or so 28mm figures waiting patiently for their turn (some of which were bought second hand and so must be stripped) and probably another 100 or so 15s on the way, so never fear, will be back to square one shortly. Normally I do burst into flames, however these are for a customer and it seems the injection of cash keeps me safe. 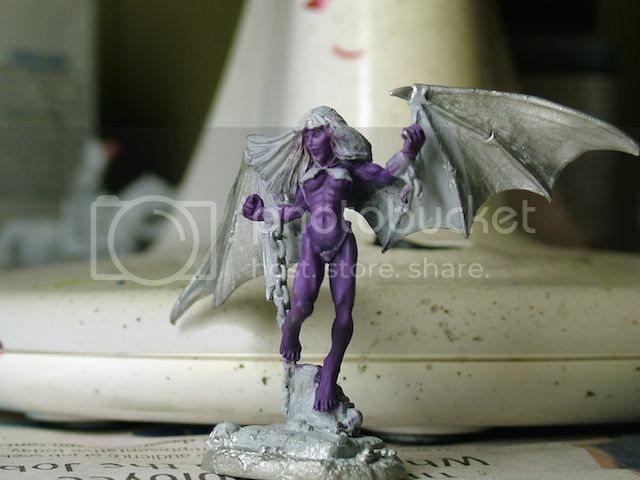 I am currently painting 28mm WSS figures, 15mm Zombies, 10mm moderns and a really bad attempt at trying a Mantic Elf for Kings of War. Having not painted any larger figures I painted two as a test run and they really look like crap. So back to the drawing board ! This reply was modified 3 years ago by PaintingLittleSoldiers. I have got four absurd Soviet era T-35’s, four SdKfz 251/C’s and one SdKfz 253 in 15mm, Also in 15mm are eight generic biblical hordes and a twelve-man section of Modern Taliban are being painted. Next up are a Soviet SMG company (80 figures) and a Soviet Infantry company in great coats (150+ figures). Arghh, I’ll never be finished. I also have Thracians, Lydians and Spanish ancients to do all in 15’s. Oh, and more Celts/Galatians. Ha Ha all my 15mm Ancients are painted !!!! I do still have Nato and Soviet infantry to paint damn it. Yeah, the Ancients have largely been ignored for the last 10 years or so, so as I am recovering and getting my painting mojo back, I’m seriously planning to get some paint on them. I hear you on the Clod War and Modern stuff too. I have got lots to paint there too. Of course before I do that, I have to catch up on reading Just Jack’s posts. Which I am woefully behind on. So much to do and so little time to do it. Oh, speaking about reading, have you read Robert Forczyk’s excellent book called Tank Warfare on the Eastern Front 1941-1942; Schwerpunkt? It’s an outstanding book and I can hardly put it down. It’s a wargamer’s treasure trove of scenario ideas and situations and really explains the strengths and more particularly the weaknesses of both the German and Soviet tank forces. I am looking forward to reading his second book on the same topic from 1943-1945! It’s a great read and is well researched and argued. I’ll see if I can get those books Rod. On my painting table….. evidence of a very troubled mind listening to View from the Veranda, I don’t know if the two are connected. and what I’m working on besides pushing some green stuff which is at the fore. This reply was modified 3 years ago by paintpig. Cheers for the quote “Paintpig”, you blog is an enjoyable visit. I have an other 2 battalions of the Legion Britannique on the work bench. Finished these two last week, battalions number 4 and 5. Ah yes the Legion, I believe I painted a couple of regiments for this some time ago. ‘Bout 5 or 6 Regt’s all up wasn’t there? AT the moment, nothing, nada, not a thing. Too busy mastering Vector Graphics for mdf madness! That’s why some of my miniatures are hairy. , I believe I painted a couple of regiments for this some time ago. ‘Bout 5 or 6 Regt’s all up wasn’t there? 5 battalions of infantry and 5 squadrons of cavalry, the jury is still out if they were line or light infantry, though I think I will base half a battalion as light infantry. A cat. That’s why some of my miniatures are hairy. Cat needs to find a new home. They were most definitely formed as a petite guerre counter force, in my mind I think they should be able to fight in companies. How is open to debate, fighting as light troops doesn’t define petite guerre but it doesn’t discount the theory that they may have been able to skirmish either. I think it would be very likely that some portion of each company or a company or two would have, light troop ability or they simply would not have been able to execute their formation mandate. Cheers for the info “PaintPig”, so I will have some based as light infantry so that I can mix and match. Finally able to paint – Broke My Collarbone in October and then just as I was getting back into action severed the tendons in my right hand… was seriously tempted to have a go at painting with my teeth at one point. Angel Barracks: The king of resurrecting old threads. My painting station is my dining room table, as I have no dedicated space for it. Sad times. Angel Barracks: The king of resurrecting old threads. 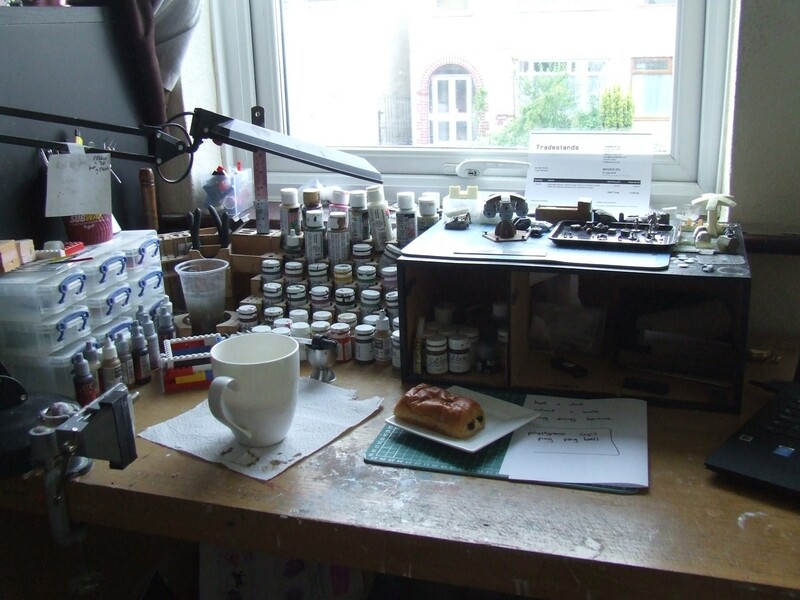 My painting station is my dining room table, as I have no dedicated space for it. Sad times. I have a guitar amp on my desk, waiting new valves. Well, he does own the site… I have a guitar amp on my desk, waiting new valves. Hang on…if Angel Barracks owns the site, then who is this Editor Mike character? Two times as un-good looking. Not giving yourself enough credit there! Apparently some strange man who plays with toys. Hang that describes most of us. 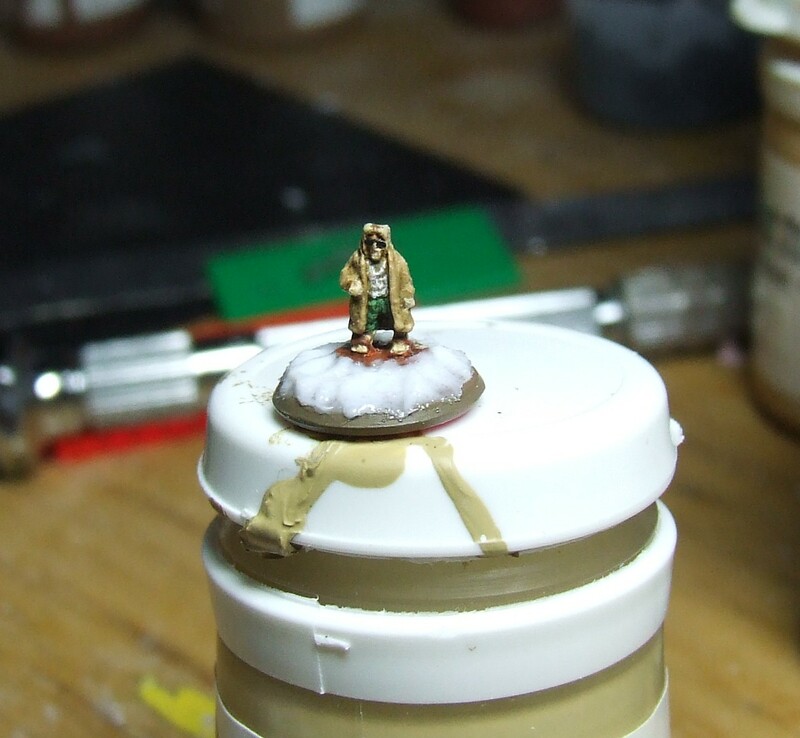 I am mostly still painting the Leven Miniatures buildings but took a moment out to start work on a wee sculpt I did. Be gentle it is 6mm, and is only my fourth ever go at sculpting. I keep my amp under the painting desk, gives it that warm rich valve sound. 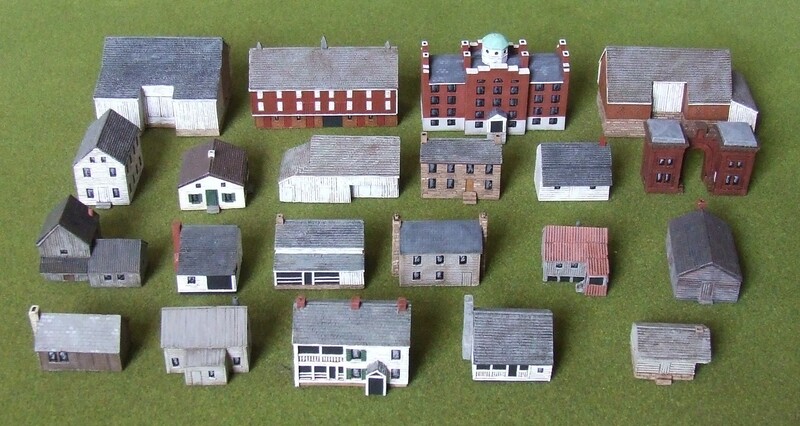 An update on the 6mm ACW buildings, getting close to them all being done now. 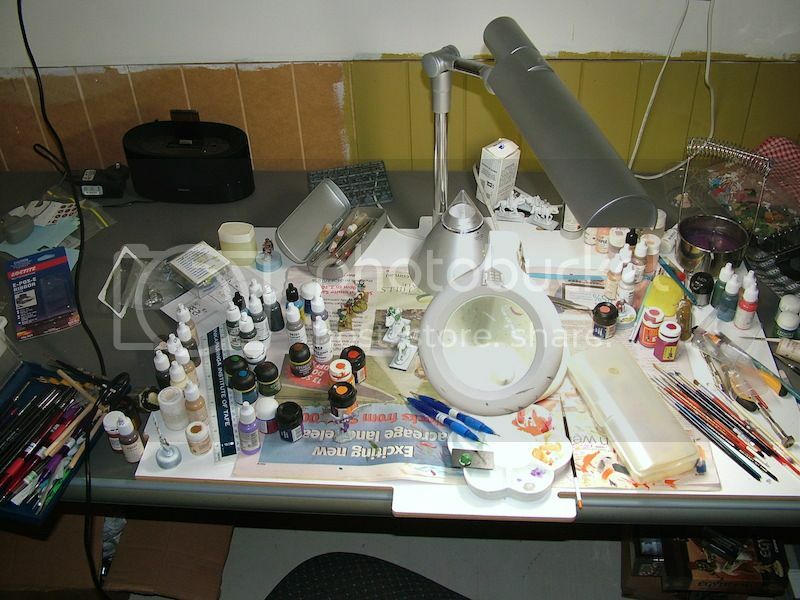 So glad to see I am not the only one with a messy paint station. Also thought I was a rare one who has many ongoing projects on the table at the same time. All ranging from 10mm Ancients to 1/285 WW2. My attention span is about as long as that of a gnat. If I am reading up on the Crusades, that is what I will want to work on. If watching a WW2 movie, then that gets pulled onto the table. Therefore, my table is a mish mash of periods. Always thought it was just me. Seeing some of these areas, I see I am not alone. Just one question for you neatniks. What is wrong with you? How can you be so organized? You are wargamers, for Pete’s sake! Today I mostly be drinking coffee and eating chocolatey bread. I’m currently painting Dungeon Worlds terrain from Acheson Creations and sculpting new figures for my own Kaiju Kaos game. I’ll try to post pix tonight (at work right now). 1 Cat Pirate 28mm Reaper? Me I am a Painting butterfly! 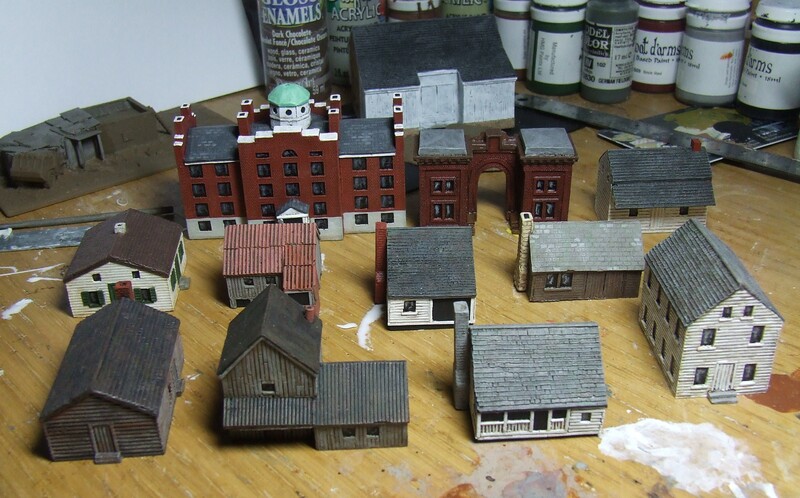 Also: 5 20mm Normandy Buildings in the process of being built from scratch. Finish these last week, Legion Britannique Ist battalion deployed as light infantry. Also finished some legion dragoons.